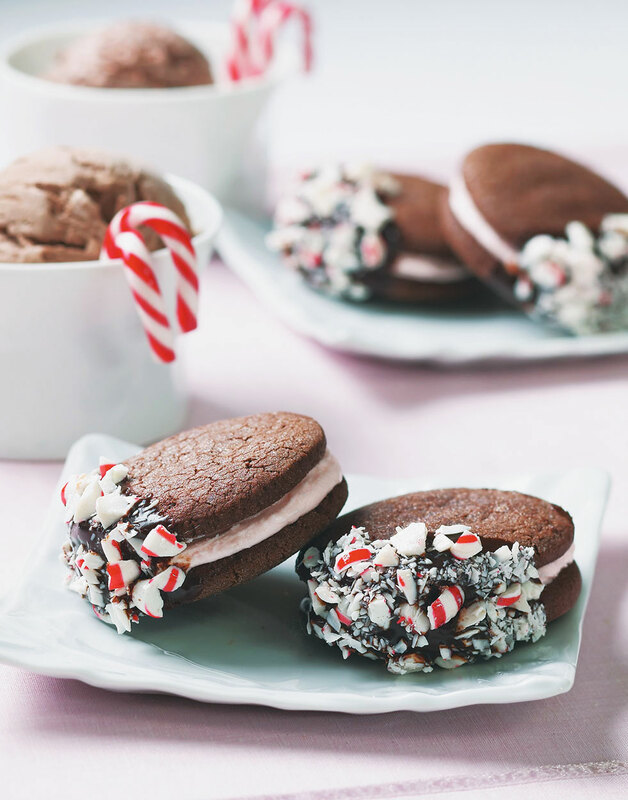 The holidays bring out the child in everybody, and these sandwich cookies are a case in point. Refined? Not really. So grown-ups, go on, lick your fingers! A boon for busy Santa’s helpers, these tasty cookies can be baked ahead of time and frozen. To decorate, just fill, glaze, and “mint” the cookies on the day you want to serve them. If the cookies are assembled too far in advance, they’ll get soggy. It’s also fine to serve the filled cookies without the glaze and peppermint embellishments. They won’t have quite the same spirit, but they’ll still taste good. For the cookies, whisk together flour, cocoa, baking powder, and salt. Cream butter and sugar in another bowl with a mixer until light and fluffy. Add coffee and vanilla, beat to incorporate, then blend in flour mixture just until dough forms. Shape dough into generous 1-inch balls. Roll balls in superfine sugar and arrange on prepared baking sheets, spacing 2 inches apart. Flatten balls with the bottom of a glass dipped in the sugar. Bake cookies 12–14 minutes, or until they spring back when touched lightly. Let cookies cool on baking sheet 5 minutes, then transfer to a rack. For the filling, blend marshmallow creme and butter in a bowl with a mixer. Add powdered sugar, peppermint extract, and food color; beat until smooth. Spread 2 tsp. filling on the flat side of half the cookies; sandwich each with a second cookie. For the glaze, heat cream in a saucepan over medium-high until bubbles form at the edge. Pour cream over chocolate and shortening; let stand 5 minutes, then whisk until smooth. Let glaze stand until thickened, about 5 more minutes, then dip a portion of each sandwich cookie into the glaze. Coat the bottom of a glass with superfine sugar so the cookie dough doesn't stick to the glass when you flatten the dough balls. Prevent “overcoloring” the frosting by squeezing droplets of food color onto a toothpick, then stirring in the color. Repeat as necessary until desired intensity is reached. Gently roll or press the glazed portion of the cookies in crushed mints so they adhere.